Thank you for God, dedicating your life to God. Love. Last week was quite an unusual one for many of us in the Parish of St. Mary’s, Leyland. 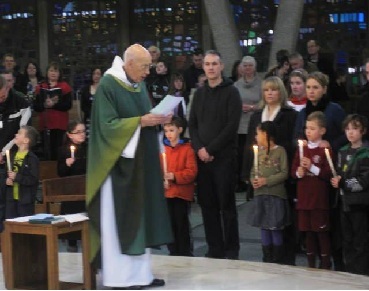 On Wednesday and Thursday, we said ‘Good bye’ to Bishop Ambrose, and the services then contained moments of beautiful liturgy, with strong feelings of thankfulness to God, for our relationship with the great man, all this imbued with a sense of loss. Two further funerals for Bishop Ambrose were to follow, at Newcastle and Ampleforth, on the ensuing Friday and Saturday. On Sunday 3rd July, there followed the Ruby Anniversary celebrations of my Priesthood. Somebody remarked they had likened the events to those of Holy Week – passion and death, preceding resurrection. Be that as it may, for me, it was most joyful, having many people gathered to celebrate my anniversary; my family had travelled good distances from Sussex, London and Cambridge, and they, together with other visitors from Liverpool and neighbouring parishes, very much added to the occasion. At Ampleforth, on Saturday 2nd July, the Funeral Mass was a simple and dignified monastic Mass. It was striking that Fr. Abbot chose the very same readings that we had used for the Requiem, at Leyland, on Thursday 30th June. We had asked Fr. Ambrose about his choice of readings for his funeral, and after pausing for thought, not answering for a while, he replied that he would leave the choice to me. As Parishioners will know, I chose the blessing he shared with me, from Ephesians (3.14-21), and then, the last section of St. John’s famous last prayer of Jesus, in Chapter 17 of his Gospel, (verses 20–26). Repeating the words he had used at Leyland only days before, Fr. Abbot asked the people at Ampleforth, to take those two scripture texts and ponder them, because we should all be people of unity – nothing being more important than that – and that our inner selves should thereby be strengthened and so attain the same certain faith as Bishop Ambrose; in this way, and by God’s power, we should all be filled with the utter fullness of God. The Ruby Jubilee celebrations came as a kind of ‘resurrection’ after the sadness of parting from Bishop Ambrose. However, though different in character, it fitted in with that ‘sense of joy and thanksgiving’ that Bishop Ambrose wanted for his funeral. There was much joy and laughter. Fr. Egidio preached about the importance of mercy, a legacy given to him at his own ordination, by the future Pope John Paul I, the Bishop at that time, who ordained him. The future Pope assembled all the thirteen young candidates, together, the day before the ordination, and spoke to them in these words: “You are young and enthusiastic now. Do not be surprised if later on in your life you will feel the burden of human fragility in yourselves. Do not be surprised, depressed, unduly worried or shocked by this. We are all fragile human beings, and God will always show you his mercy to help and support you.” Fr. Egidio then told everyone he would be giving me a book, as his present to me, for my 40th – and the book, the ‘Diaries of Saint Faustina’, who was the Polish nun, canonised by Blessed John Paul II, because she was the saintly person who promoted this aspect of God – God’s infinite mercy. Fr. Egidio obviously saw that Popes, JP I and JP II, had a spiritual awareness, both as Popes, of the importance of Divine Mercy for our world. This has been my own reflection, also. On Sunday, the sun was shining brightly: the celebration in Church was a ‘firework’ of joy, as was the shared lunch afterwards, in the garden, bathed in God’s sunshine. Children played, people chatted and ate and drank and the whole liturgy went on, smoothly, from Church to Garden. At this point, I want to thank, through the auspices of this blog, all who so generously gave me gifts of many different kinds – all of them so greatly appreciated – and the words on the many cards I received, not to mention the large gift of money, of over £1500! Somebody asked how I hoped to spend it, and, at this moment in time, I am hoping to ask Fr. Abbot, his permission to go on an ecumenical pilgrimage to the Holy Land, next year in March, organised by an Anglican friend from the Focolare Movement. I have had the grace and privilege to go once to the Holy Land; if granted, I hope this second visit may be even better than the first. The young children gave me their presents, and these touched my heart, deeply: one was from those who attend little Church, and two others were received from St. Anne’s and St. Mary’s Primary Schools. The words the children wrote bring this blog to an end, no doubt because great wisdom comes from the hearts and minds of young children; clearly, they had not been instructed or told what to write – these thoughts came from them – from their hearts. There are some pictures alongside the texts; some of the nicest are of me on my ‘bike’ riding around Leyland, some of me vested ready for Mass. “I am very happy that you believe in God”. “Happy anniversary. I hope you have lots of fun”. The final one is special because it brings all glory to God, and that is as it ought to be.